A while back I bought a Samsung 840 EVO as it seemed like the best bang for the buck consumer solid state drive. It has performed flawlessly for almost 2 years. 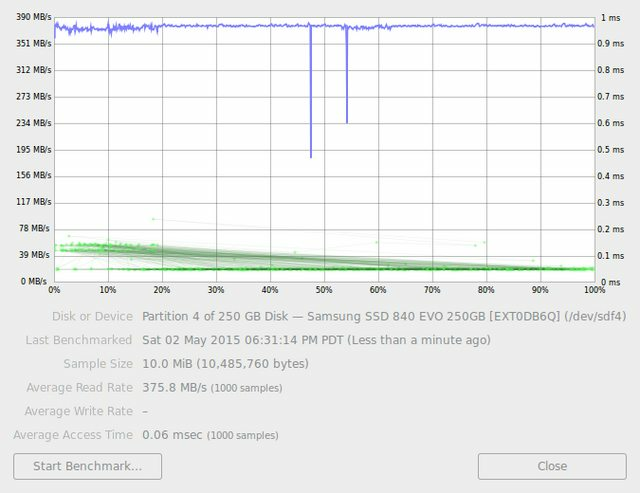 There are stories of people seeing decreasing performance as the NAND cells degrade in this TLC SSD. There was a firmware update in October 2014 and then a another one in April 2015 attempting to correct the issue. I haven’t noticed any issues, so I didn’t rush the update. Today I took some time and bit the bullet to update it and hedge against disaster. Naturally, the update is distributed primarily for Windows users and I run Linux. Challenge accepeted. I grabbed the EXT0DB6Q 840 EVO firmware update for “Windows” users and took a look (2ad2496632c3eee3fc12b1673a2ee3a9965ae773 Samsung_SSD_840_EVO_EXT0DB6Q.iso). Inside the ISO9660 image is an ISOLINUX bootloader, MEMDISK kernel wrapper and a FreeDOS filesystem. Replace (hd6) with the path to your storage device of choice and then boot! Pretty anticlimactic actually. No data was lost going from EXT0AB0Q to EXT0DB6Q. I had backs-up just in case though, and so should you. I did some quick before and after tests using GNOME Disks Utility. There was a noticeable performance improvement in consistency of the device, but a slight average throughput decrease. The before and after results were quite repeatable with the for people more interested in performance details. Note the firmware version, partition and sample size in the screenshots. The most significant improvement is visible in the following screenshots. The first image is before the firmware update and the second image is after the firmware update (surprise!). For this partition, a rarely used 14% full 124GB btrfs partition, the first 20% of the partition had volatile throughput performance. The before and after results were quite repeatable with and more tests can be found on Imgur. The latency was all over across tests since the disk partially in use by some background tasks in Linux, but largely unchanged by the update. I speculate that the volatile performance is in the region of the disk where data is actually stored, the numbers seem to make sense. It’s worth noting that the average performance did decrease a slightly: 385 MB/s -> 375 MB/s. The biggest shock of the firmware update is all the new SATA errors my kernel (Arch Linux pkg linux 4.0.1-1) has been spewing on the same interface the SSD is on. 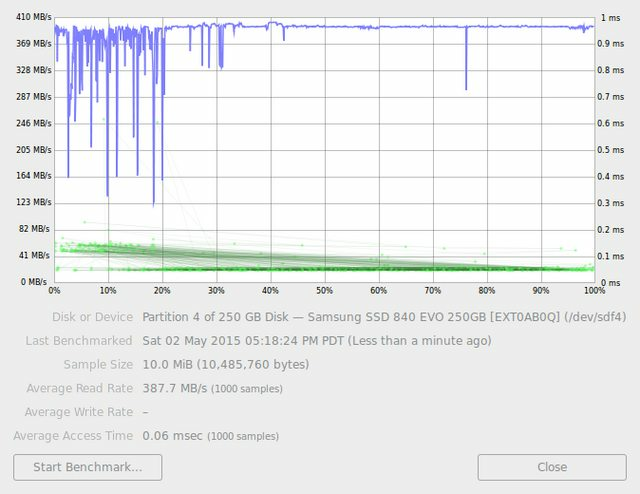 I went from a fast drive with minor performance inconsistencies to a consistently (slightly) slower drive with SATA link timeouts. Great! More errors on my Github Gist for those interested. It’s worth mentioning that dm-cache/lvmcache is thrashing that SSD after I took my SSD cached logical volume out of cleaner policy and back to mq policy. Eitherway, the device shouldn’t timeout SATA commands even if it is busy. Time to double check that my daily back-ups are operating as expected. Currently my system generates sporadic timeout errors. I’ve abandoned the hope that a background firmware task was doing something and would pass. I’ve now re-mounted all my filesystems (btrfs and ext4) without the discard flag I was using before. There’s a chance this is the smoking gun as I’ve seen this before. Someone commented on my Github Gist saying they are seeing the same issues. Anyone else? Post in the comments below. Others are experiencing this problem. There is a work around.